On sale at our location in the Salem / Keizer area is a product you will Come to Love. This product has cut our polishing time down from three hours to a mere half hour and which includes the prep time of gathering the red shop rags that Gord says to use. Apply the polish directly to the spot , normally a two by two I have found to work best and rub it in with the red shop rag for a minimum of two minutes. This allows Gord’s Polish to work on the Aluminum for max effect. Then use a clean red shop rag or micro fiber towel to buff off the now blackened polish and revel the mirror shine. In less than ten minutes you can have a section of polished metal that you will be proud of. Now a word of warning is that you must maintain the polish wetness to achieve the desired mirror effect. It has been advised not to use this in direct sunlight as the polish will dry to quickly. Personally I have attempted to use the product in other than perfect shade and it doesn’t work well at all. If your like me you scan the instructions to get an understanding of what must be done or not read them at all. I strongly suggest for maximum results you do not take this approach. For instance, The instructions that came with Gord’s Polish stated that you must buff the product off when it is still wet unlike most polishes. I let it dry and attempted to buff it of with a buffer and ended up with what I call a patina, gord’s calls it the burnished look. Not the desired effect I was looking for. I was looking for that mirror image that will give you a suntan in moments in direct sunlight. So I read the instructions, applied the procedure and low and behold, a mirror shine just like I was looking for. Of course it has been years since this Airstream had been polished. So with a liberal amount of Gord’s Polish I set to work with the suggested (0000) steel wool and a red shop rag to make sure the years melted away to a brite and wonderful finish. It still took me less time to make this happen than what it would have using conventional methods. Truly a miracle polish that can make my work easier. Below is a link to 52 video’s of just how great this product works. Seeing is believing. Check out Gord’s Video’s and then give us a call or come by and check out the Vintage Air Stream’s for yourself. 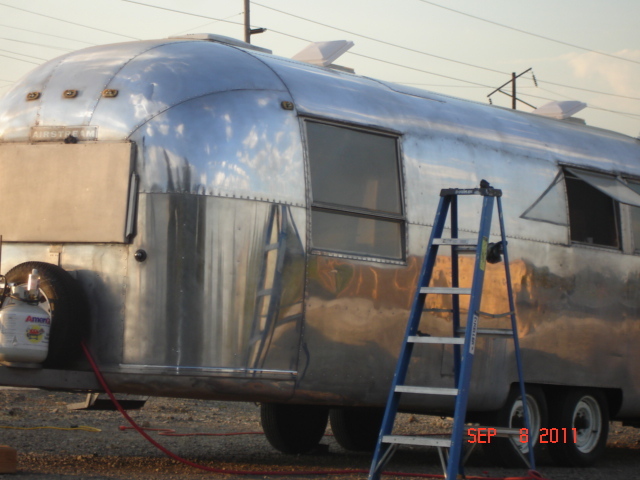 Remember that we rent Vintage Air Streams from our location right here in the Salem/ Keizer area. This entry was posted in RV and Semi Truck Detailing Salem / Kezer Or., Trailer Rentals - Salem / Keizer Or. and tagged Gord's by admin. Bookmark the permalink.